To make the crust, in a large mixing bowl, stir together flour, sugar, salt and baking powder. Work the butter in, using a pastry blender or your fingers, until pea-sized lumps form. Sprinkle in the water, 1 tbsp. at a time, stirring gently with a fork after each addition and adding only enough of the water to form a rough mass. Preheat oven broiler. Place apples on a large sheet pan. Broil 5-6 minutes, stirring once, until apples start turning golden brown; remove apples from oven and place in a large mixing bowl. Melt the caramels and milk together in the microwave and stir well; stir in vanilla, cinnamon and ginger until combined. Stir caramel mixture into apples until combined. Roll one dough disc out thinly on a floured surface, using a rolling pin, and fit into a 9-inch deep-dish pie plate, and place on a cookie sheet; fill pie shell with caramel apples. Roll out additional dough disc and top apples; trim and flute edges. Slice some cuts in the center of pie. Brush a little milk whisked together with an egg evenly over pie dough and sprinkle with coarse sugar if desired. Bake for 20 minutes or until golden brown. Reduce oven temperature to 350 degrees, and bake an additional 40 minutes (covering with foil in the last fifteen minutes) or until deep golden brown. Cool on a wire rack. Serve with caramel sauce, toasted pecans, and vanilla ice cream. 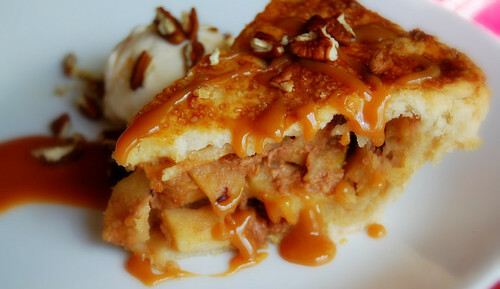 41 comments on "Deep-Dish Caramel Apple Pie"
This must taste fantastic yum! i didn't know about the cheese either, until i made my apple pie this year. although it wasn't cheddar, it was delicious :) we'll have that one for dinner, embrace the caramel one for dessert!! Caramel sauce is so much better with apple pie than cheese...no contest. And I agree with you, combining several varities of apples is the way to go. Gorgeous pie, Emily. Your little cutie patootie is adorable. Love those little trick or treaters. Wow! You BROILED the apples? That's wild. That sounds like one heck of a pie. I agree about the cheese. I don't mind cheese with apples INSTEAD OF pie, but not together. 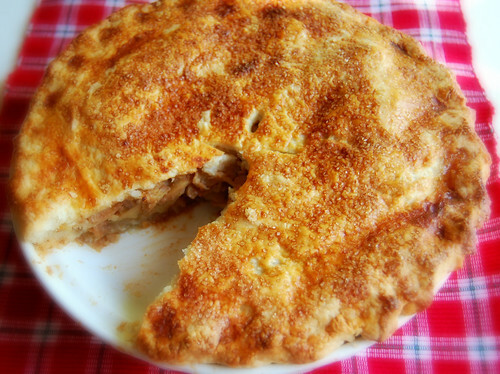 the very thought of cheddar cheese muddying up my beloved apple pie makes my stomach turn. what a wretched idea. i’m with you—give me ice cream as an accompaniment any day. great twist on a classic, emily! Wow this pie is awesome! I love the sweetness of it all...I'm a sucker for anything my dentist would hate me for :) I, like you, have never had cheddar with my apple pie but there are a lot of people who really do love it. Interesting is all I can say. But, first, I'd love to dig into that pie of yours. It looks heavenly!!! The crust of the pie almost looks like it has grated cheddar on top!!! I would also opt for the caramel rather than the cheese!!! Your nephew is too cute as Yoda! And how cool that your mom made his costume?! Grandmas rock. Emily, I love the addition of the caramels. It just puts it over the top. I have to try this one sometime. Love the crust...it looks nice and thick, I I also don't care for apple pie with cheese...blah! I love the caramels in the filling. Delicious. Sort of like candy apples in a pie. I guess if you can have a cheese course for dessert, you can have cheese with your pie. My grandparents liked cheddar cheese with their apple pie. If you like fruit and cheese, or sweet/salty, it makes sense. However, I think cheese would go well with a tarter apple pie. A really sweet one filled iwth caramels wouldn't work. Awww, your nephew is adorable! 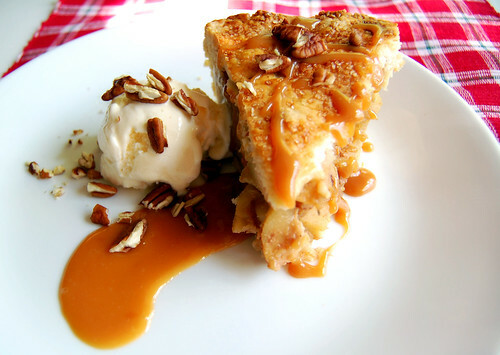 Now that is one gorgeous pie - love all the caramel! I've never had cheese with pie before either but it definitely seemed to be a trend for awhile. This pie speaks to me. Yum!! Oh Emily I never understood that cheese-apple pie connection either! And I love raw apples with cheese, but in a pie it sounds too "cheesy"! Your pie looks delicious and so does your cute nephew! So I think we are so on the same mental wave length, I have some delicious apples that will waste away and need to do something with them! I have never made a pie from scratch! Embarrassing, yet true!My relatives (on the married side) eat Cheerios with milk and a slice of cheese in the morning! I am so not kidding, weird! 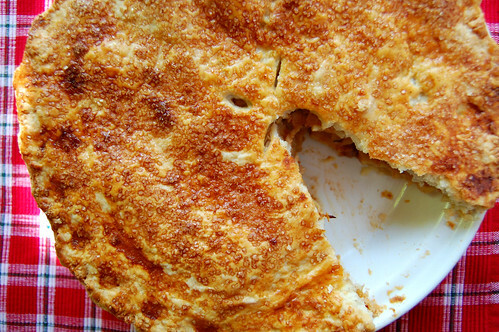 Having cheddar cheese with your apple pie is an English thing, although Canadians do it too. I don't understand why people hate on things that happen to be different. Try it before you knock it, guys! Oh, apples and caramel!!!! Love the combo. It looks so divine. Your nephew is adorable! Love his costume, I do. :) This pie sounds very tasty. I've never been one for cheese on my apple pie...that just sounds kinda gross to me. Cheese, really? I have never heard of that! Looks delicious and your little trick-or-treater is a cutie! What kind of mixture of apples do you suggest in making this pie. I don't like fruit pies, but the pictures are beautiful. Might have to make it as a dessert for work some night! Anon, yeah, I don't really hate cheese with apple pie that much. I was just trying to find a way to connect apple pie with that picture of my nephew. Jackie, good question. I kind of like Gala because they're reasonably priced. I'm a big fan of Macintosh and Jonagold, too. Heck, you may even want to try Honeycrisp if they're not too expensive. I love the caramel all over your pie! I agree- much prefer that to cheese. Yet half the people I know want cheese. I love cheese, but I don't have to have it with apple every time (nor the other way around). Your nephew is so cute! And this pie is divine. MMMMMMMMMMMMMMMMMMMMMMMMMMMMMMMMMMMMMMMMMMMMMMMMMMMMMMMMMMMMMMMMMMMMMMMMMMMMMMMM,...I so love caramel sauce!! That pie looks excellent, Emily!!! Be still my heart. I love this. I think apple pie and cheese is a Yankee thing. Beautiful pie!!! I do love cheese with my apple pie (sometimes I make a pie crust with cheddar in it), but ice cream is also great, of course!! Also, you can "hate on" whatever the hell you want. So what if you offend a random cheese enthusiast? That's life. Eric, cheese is a subject that draws much passion from people. They simply cannot contain their feelings on their love for cheese. Think of all the happiness that cheese brings us in our day-to-day lives. Cheese pizza. Macaroni and cheese. Cheese enchiladas. We must appreciate it. We must honor thy cheese. Thank you. I know you love my pie. I was seriously thinking about making a deep dish pie and how great it would be with caramel. Thank you for posting this recipe...you took all the work out for me! Now to the fun part, making it! what a cute lil nephew!! I never understood the apple pie and cheese thing either...but I am planning on making an apple pie for thanksgiving....and what is better than apple and caramel together?! Yum! Jayden looks adorable as Yoda - your mom is clever to be able to sew (I am hopeless). And as for that pie - YUM!!! OMG - just made this pie, it was sooooo delicious! This was amazing! Made it for Thanksgiving & it was a huge hit! Thanks so much. Love your blog! Your recipe is impressive! I will definitely try this. Some of my favorite fruit recipes can be seen at gourmandia, with video recipes and printable recipes.